Terramundi was established by Dario Illari and Jacquie Ryle over 18 years ago in the upper floor of a flat in Kentish Town; the Studio is now somewhat larger and is located in Tottenham Hale, London. These terracotta money pots are hand thrown in Italy and hand painted in London. They stand between 17cms and 19cms in height. Each original money pot contains a separate fortune coin and hold approximately $1000 in gold coins. Money pots are sometimes used to house a candle or a plant once smashed. 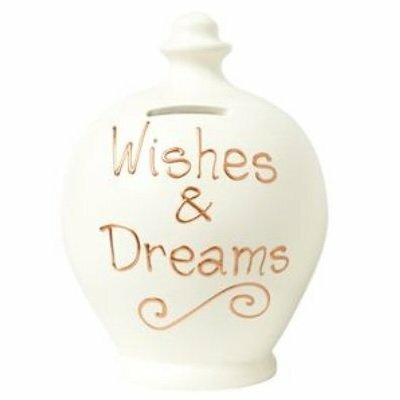 The best way to break your money pot is to get a chisel or the back of a hammer and place it inside the money slot - slowly lever the top and you should be able to pop the top off - you can now use the money pots to house a plant, sweets or pens. If using a hammer or a chisel to smash your money pot or even dropping the money pot within a plastic bag, please take care to wear protective eyewear.